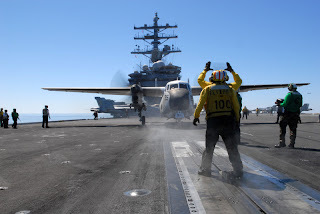 I'm currently afloat the USS Ronald Reagan as part of my naval duty. The ship is currently underway conducting carrier operations. The ship is an amazing vessel--it is a working airfield above a city of some 3000+ individuals. As a policymaker, I have noticed the great recycling program onboard, the efficient upkeep of the ship, and expertise with which the public employees that make up the United States Navy dispatch their duties. Because the ship is named after Ronald Reagan, I was particularly pleased to see a lot of California artwork and memorabilia around the ship. I even found a mini-"Walk of Fame" onboard that has Hollywood Blvd.-like stars embedded with actors' names in one of the passageways. Even at sea, Hollywood is always close-by! See you soon. Every year the City of Los Angeles recognizes extraordinary women through our Pioneer Woman Awards as part of National Women's History Month. This year, I was proud to select community activist Pilar Quispe as the Council District 13 Pioneer Woman. 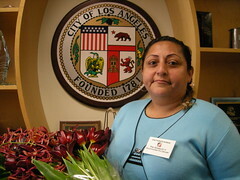 Originally from Peru, Pilar moved to Los Angeles more than 20 years ago to seek new opportunities for her family. Top among her priorities was ensuring that her children had access to a quality education. As her children attended local schools - Grant Elementary, Le Conte Middle, and Marshall High - Pilar organized parents to fight for more resources to help their students learn and to prepare them for future success. In recent years, Pilar has expanded her community activism to include fighting for resources to address at-risk youth and gang violence in the community. She is currently working with the Children’s Hospital of Los Angeles and the Drug Free Community Initiative, which is organizing local residents to help prevent drug and alcohol abuse among at-risk young people. Pilar has helped dozens of neighbors form their own neighborhood watches and helped to build a network of Peruvians living in Los Angeles that raised funds to send to Peru after the tragic earthquake of 2006. Pilar epitomizes the definition of a ‘pioneer’ and we are all very fortunate that she chose to dedicate more than two decades of her life to making Los Angeles a better place for us all. 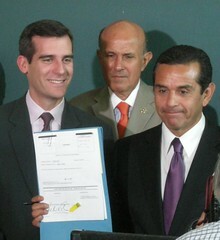 We want to make it easier to do business in and bring jobs to Los Angeles. But for some businesses - particularly small businesses - navigating the city's entitlement and permitting process can be a nightmare. I joined Mayor Villaraigosa and Los Angeles business leaders to announce a program called 12 to 2 that will reduce the number of city departments that business owners and builders will have to visit to receive their entitlements and permits from... you guessed it, 12 to 2. They will go to Planning for entitlements and Building and Safety for permits, and that's it. 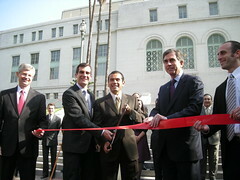 Cutting red tape not only helps our economy, it helps us make better use of our city resources. We don't need 12 departments managing paperwork when two departments can coordinate the review of business or construction plans. And by coordinating the efforts of our city departments, we can better ensure that new projects are assets to our neighborhoods. Listen to Council Committees online! As part of our continuing efforts to make government open and accessible we have expanded our online access to include Live and On-Demand Streaming Audio of all Council Committee Meetings. This is in addition to the Live and On-Demand Streaming Videos of our regular City Council Meetings. You can now listen at any time of the day to the committees discuss issues ranging from Governmental Efficiency to Housing, Community, and Economic Development. These audio links can help you find information on the matters that you most care about. We have also added other features, including a search and retrieval function of all archived meetings, which you can access any time at your convenience! You can find the new and improved streaming at the City’s Website. In the past few weeks in the 13th Council District, we have seen gun violence destroy families and victimize neighborhoods. In the case of Anthony Escobar, the 13 year-old Echo Park boy who was shot and killed after picking lemons at a neighbor's home, police are still working to apprehend a suspect. This case, and every other crime involving a gun, demonstrates the need to give law enforcement every tool possible to track down suspects. That's why it is so important that Congressman Becerra's National Crime Gun Identification Act be passed into law. Yesterday, the City Council unanimously passed and the mayor signed a resolution putting the City of Los Angeles officially on record in support of the Act. The bill, H.R. 5266, would require that all guns sold after January 1, 2010 be equipped with microstamp identifiers that would etch characters onto fired bullets. These etchings would allow crime investigators to identify the make, model, and serial number of the gun from which the bullet was fired. The National Crime Gun Identification Act is strongly supported by law enforcement officials including Los Angeles Police Chief Bill Bratton and Los Angeles County Sheriff Lee Baca. Today I joined Enterprise Home Ownership Partners (EHOP) and the Hollywood area Community Redevelopment Agency in announcing the East Hollywood Energy Conservation & Safety Grant Program. The program will provide grants of up to $5,000 for low-income residents of East Hollywood to install energy efficient improvements to their homes. These energy efficient improvements include tankless water heaters, attic and floor insulation, emergency gas valves, and AC replacements. This program is available for owner-occupied homes only and operates on a first come, first served basis. The first five families to submit a completed application may also be eligible for free installation of an up to 3kWh electric generating solar system to further reduce electricity costs. To apply for a grant, residents should contact Annette Orozco at Enterprise at aorozco@eneterprisecommunity.org or (213) 833-0053 or Mayra Rivera at the Community Redevelopment Agency at mrivera@cra.lacity.org or (213) 977-1755. Our city is facing a budget crisis and we know that we need to make sacrifices to keep our city fiscally sound. The City Council is deeply committed to the responsibility we have to the people of Los Angeles to protect core city services, such as public safety and trash pick-up. Today, my colleagues and I announced that City Councilmembers and our Chief Legislative Analyst have committed to collectively returning $1.2 million from our office funds to help balance the city’s budget. This amount is in addition to the $600,000 of Council office discretionary funds that we gave up to close a mid-year budget gap earlier this fiscal year. We have faced tough budget times in previous years and have met the challenge of closing the gap. Working together with the mayor, city employees unions, general managers, and others, I am confident we will balance our budget. This morning there was another tragic shooting in CD13 that resulted in the death of a 13 year-old boy. This tragedy comes amidst a rash of violence that has hit Northeast LA over the past several weeks and demonstrates yet again our city’s need to make safe communities our number one priority. We are losing too many young people to senseless violence, and our community, including elected officials, community leaders, local residents, businesses and law enforcement, must work together to end it. Tomorrow my office and the Los Angeles Police Department will be leading a Public Safety update and neighborhood walk at Washington Irving Middle School. Every Saturday this month, I invite you to join me, members of the police department, and your neighbors in Glassell Park where we will meet to start the process of working together and communicating with each other to help reduce violence and crime in our neighborhood.